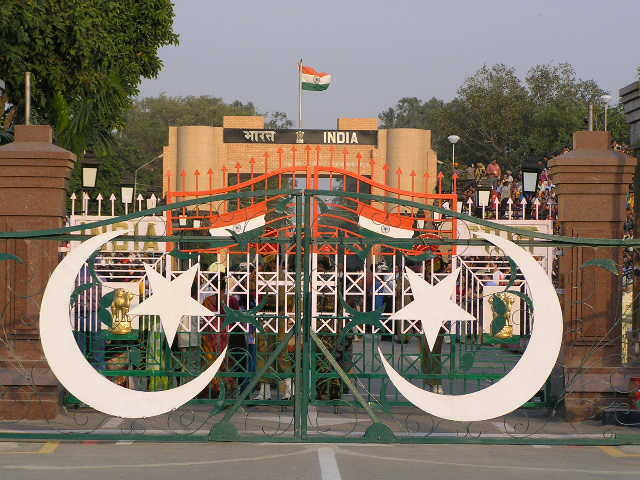 The closed gates marking the Indo/Pak border. 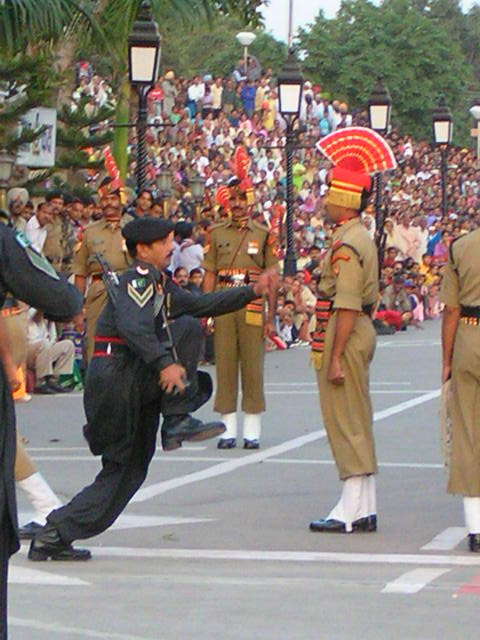 The ceromony of the lowering of the flag at the Pakistan-Indian border must rate as on of the most bazzar things in India or Pakistan. These two nuclear rivals who were on the brink of war a few years ago and have been engaged in war several times since partition in 1947 perform a sycronised masterpiece everynight in front of thousands of charged up Indians and Pakistanis. I've crossed this border four times previously and never witnessed what is a not to be missed display of staged nationalised pride. When I crossed this border the first time the viewing platforms were just being constructed and both sides were trying to out do each other in the grandosity of their arenas, I think Pakistan won on this one? A Pakistani stooge taunts the thousands of chanting Indians. Two Pakistani stooges race around in the front of us waving their Pakistani flags trying to awaken the megre Pakistani crowd and at the same time taunt the Indian masses some 50m away. 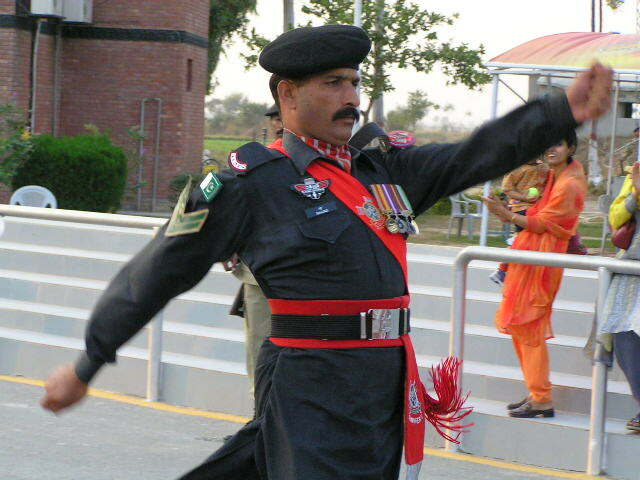 A Pakistani soldier marches aggressively and double time towards the border gates. The two camps couldn't be more different if they tried. The Indian side is a super colourful, guys sat next to girls and all singing and chanting in unisen. The Indian speakers belt out upbeat patriotic Bollywood kind of tunes as the Indians keep filtering in to waht is more like a pop venue. 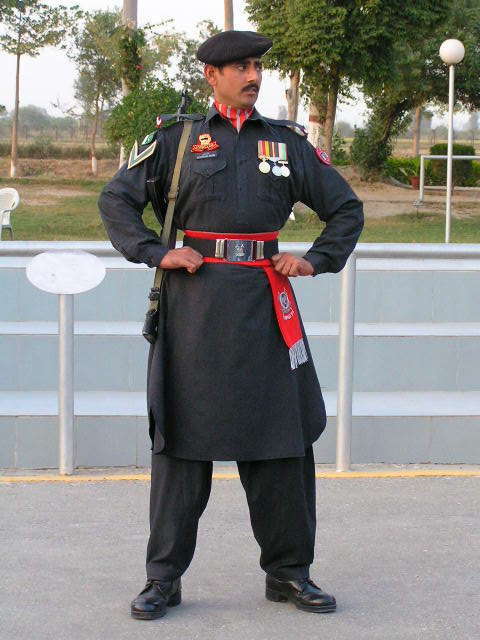 On the Pakistan side few women make it and the men wear dull coloured shalwar khameez. I may be stood in Pakistan but I long to be on the other side of the gate right now! Soon it's time for the show to begin and soldiers appear on the Pakistani side and judging by the noise from the Indian side the soldiers are there too. A microphone is held at the mouth of an Indian soldier and both camps send soldiers marching aggresively towards the enemy, snarls and all. Both gates are flug open and after a little bit of stamping and other general childish behavior a brief and forced handshake is given before a retreat is made before the gates are well and truly slammed too. a rather dirty look to the nearby Indian soldiers. Each camp then gives a short display to their respective crowd with the usual marching, foot , stamping, aggressive stares and stance and some rather impressive high can-can kicks. All of course is mirrored on the Indian side! 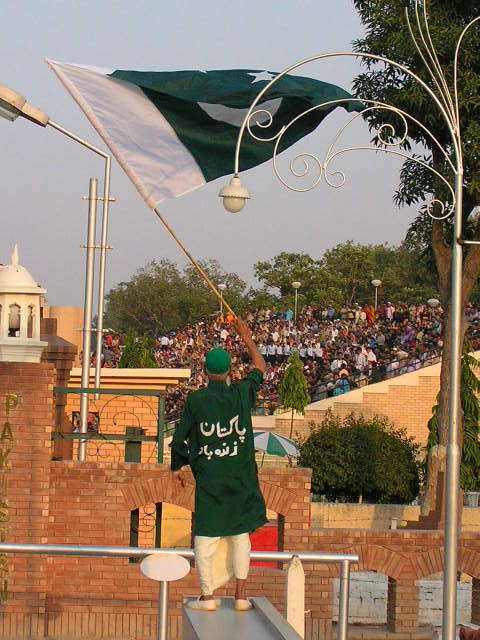 One of the stooges climbs the Pakistani terraces and begins chants and taunts aimed at the Indians. But I have to laugh more as they start to shout Allah and then Alah akbar (god is great). On the Indian side it's a different story. The crowd seem alive and there to enjoy the spectacle. Maybe it's their overwhelming numbers, or maybe there's a free spirit within the mix of sexes and cultures on the Indian side? Both gates are once again flung open and more tantrums are displayed as both camps face each other, chests bulging out and more deathly stares shared. The flags are then lowered after more ceromonial rope throwing and pagentry. Both flags are kept at the same height to show a mutual respect. ....and lots of foot stamping.